what is the best approach for that ? and if you have any sample report I will appreciate it if you could share. Attached is a simple example that hides/shows the chart by the bookmark ID (created in 4.8). I have tried to click, Ctrl/Alt click, Shift Alt click but it is not doing much, am I missing anything? Go to the Window menu in the designer and select Preferences. Under "Report Design" in the left pane, click "Preview". 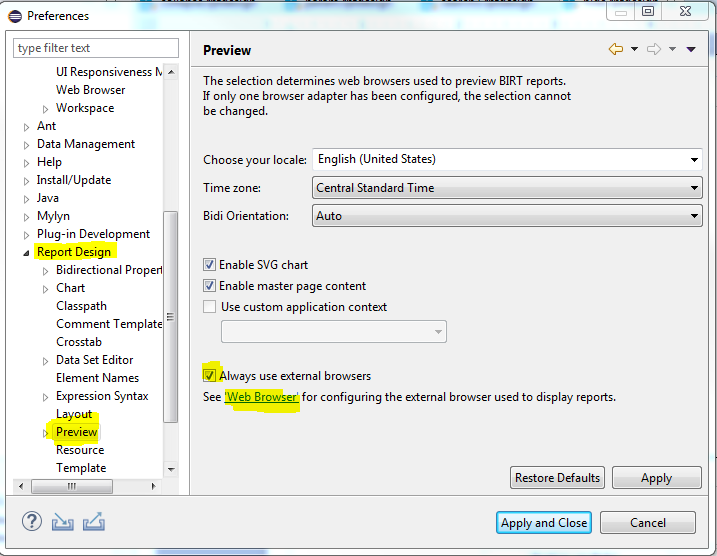 At the bottom of the right pane is a checkbox labeled "Always use external browsers". Make sure it is checked. Directly beneath it is a "Web Browser" link. Click it (or go to General > Web Browser in the left pane). Choose or add the browser you would like to use to test. Save the changes.